Here’s a stat for you: The average age of the top 10 has steadily been increasing since 1992. What’s going on? Wasn’t tennis supposed to be a young man’s game like when Boris Becker burst onto the scene to win Wimbledon at 17, Lleyton Hewitt took the game by storm at 16 or Pete Sampras winning the US Open at 19? Perhaps what we were forgetting back then, was how unfit or unmotivated the over 30s were and that this was mandatory retirement age that players should be planning a 2nd career? Why The Changing Age Curve in Tennis? With prize money at an all time high, winning a few rounds at a Grand Slam or Master Event is worth the airline ticket. If a player makes it to round 1 in a Master event, he gets $10,000. You make a name for yourself and with endorsements and appearance fees, they are set for life. Never mind a coach, a top player needs a fitness coach and nutritional coach. The top 5 know this better than anyone. They don’t party (much), are leaner than a Gazelle and rae back in the gym the day after Christmas. There is no other way if you want to win in 5 against Nadal. Feet are very important in tennis and good shoes are critical. Developments in how the foot moves in relation to shoes are high tech and the pounding the players place on their feet is relentless. Clay courters especially have benefitted from this. Advances in the medical field mean that a player’s shoulder or knee can be re-constructed back to former glory. Just look at Tommy Haas, who has had multiple surgeries and is threatening the top 10 again at 35 years old. Time out of the game for injuries might have helped too though and preserved some of the mileage, just look at the perma-injured Brian Baker. With a few exceptions like Jurgen Melzer or Michael Llodra, to be a top singles or double player something has to take a back seat. Daniel Nestor at 40 is the best doubles player because there is less running in doubles and the stress and strain of singles is not a factor. Sure, a top singles player might play Davis Cup doubles or enter a Grand Slam for the fun if it, but there is no real motivation to keep both up. If 30 is the new 20, then 20 must be the new 10 and 10 is not the peak of emotional maturity. So that’s gone a bit far but you get the point. By 30, the distractions of life on the road should have tempered and all the pieces should be coming together such as the lessons in defeat, the savoring of success and all that jazz. Today’s game is physically and mentally tough and it takes a few more years now to get it all together. This is simply all of the above added together. Work in the gym, on the practice court, on the mind and on the body. Today’s professionals are just that – professional like any other profession. You just have to look at the slim margin of error. 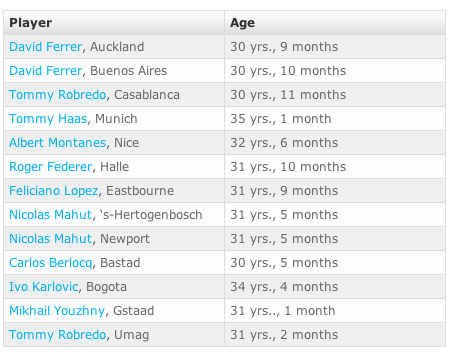 If Roger Federer takes his foot off the gas or has a small injury, he’s losing to players outside the top 100. the competition is that intense, even for a legend. It could be sometime though, before the average age of retirement reaches 95 like Artin Elmayan! Another awesome post on your site, keep up good work!